The UN's Millennium Development Goals (MDGs) are "difficult or impossible to meet" without curbing population growth, a UK parliamentary group says. 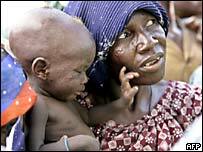 It concludes that a high birth rate in poor nations contributes to poor health and education and environmental damage. The global population is forecast to reach about nine billion by 2050. The All Party Parliamentary Group on Population, Development and Reproductive Health will publish its report later this month. It has spent six months taking evidence from expert witnesses for the report, Population Growth - Its Impact on the MDGs. "No country has ever raised itself out of poverty without stabilising population growth," said the group's vice-chairman, Richard Ottaway MP, at a seminar on population issues this week. "And the MDGs are going to be difficult or impossible to attain without a levelling out of population growth in developing countries." Over the course of the last century, the global population rose from under two billion to just over six billion. The bulk of the growth came in developing countries. "Ethiopia had five million people in 1900; now it has 64 million, of whom eight million are receiving food aid," said Mr Ottaway. The projected figure for 2050, he said, was 145 million. Growth is now levelling off in most of Asia, Latin America, and the Middle East; but in much of sub-Saharan Africa it remains very high. Whereas many Asian countries are seeing birth rates of about two children per family, some African nations are still around five per family. The UN's own report into the MDGs earlier this year noted that the number of people living on less than $1 a day in Asia dropped by nearly a quarter of a billion people between 1990 and 2002. But in Africa, the number in extreme poverty increased by 140 million. "I would agree with that," said Dr Tiziana Leone, a population studies lecturer at the London School of Economics who submitted evidence to the All Party Group. "We do see an impact of rapid population growth on poverty and on the health of mothers and babies," she told the BBC News website. "But we are also seeing an impact of the ABC rule (Abstinence, Be faithful, Condoms) for funding health programmes which has shifted a lot of funds into the A and the B, and you're seeing the price of condoms in Uganda for instance going really high." The ABC approach is encouraged by the US government, which was accused earlier this month by the UN's HIV/Aids envoy Stephen Lewis of practising "incipient neo-colonialism" by telling African nations how to fight the disease. On the environmental side, Mr Ottaway said the evidence was more equivocal. Population growth was not at the moment contributing to climate change, he said, because the fastest growth was seen in countries with the lowest emissions. But it did contribute to strains on water resources, fish stocks, farmland, forests and wildlife. Earlier this year, the head of the British Antarctic Survey, Chris Rapley, said the Earth was struggling to sustain current population levels. In the 1950s and 60s, concern about the Earth's burgeoning population was widespread among academics, including economists, said Adair Turner, who also spoke at the London seminar. Mr Turner headed the British government's Pensions Commission and is a former director of the Confederation of British Industry. "The economics community went through a period of doubting whether it should be addressing the issue," he said. "That was primarily for reasons of economic theory, although there were religious reasons in there too." Now, he said, economists were revisiting the subject. Even in developed nations, said Mr Turner, going beyond a certain population density would impact economic progress. He said the approach should be to tackle high birth rates with voluntary measures - providing education for women and making family planning available - with which Richard Ottaway agreed. "We have the solution; it's not that difficult," he said. "The question is: will we go for it?"